The objective of Fan Tan is relatively uncomplicated. You deal out the entire deck of cards among the players, and you spend the game trying to get rid of all your cards before the other players can manage the feat. You get rid of cards by adding them to an already existing run, or sequence of cards in a suit, which builds up during the play. You can play a single card whenever it’s your turn. You have to build the cards up and down in consecutive order, starting from the 7 in each suit. After someone plays the 7 of a suit, the next player can legally put on the 6 or 8 of the suit. If the 6 hits the table, the next player has the choice of adding the 5 or 8. If he plays the 8 on the 7, the next player can put down the 6 or the 9, and so on. After the first 7 is played, if the next player has no 7 or can’t add to the cards on the table, he passes. You must play if you can. To determine who gets to deal first, pick someone to deal a card face-up to each player until someone receives a jack; the lucky prince gets to deal the first hand. For subsequent hands, the deal passes one place clockwise. After shuffling and offering a cut to the player on his right, the dealer gives out all the cards, facedown and clockwise. If you’re playing with four people, everyone gets the same number of cards. If you’re playing with three, five, or six players, some people get more cards than others (you just can’t divide 52 evenly by 3, 5, or 6). This imbalance gets corrected over the course of a round of Fan Tan because everyone deals a hand and gets extra cards on some hands during play. If you play the game for stakes, you can make it that the players with fewer cards put in an extra unit to compensate for starting the game with such an advantage. The player to the left of the dealer has the first opportunity to play. If she has a 7 in any suit, she must play it by placing it face-up in the center of the table. If she doesn’t have a 7, she passes. If you have more than one 7, do not automatically put down the one in the suit in which you have more cards. Put down the 7 where you have more awkward end-cards such as aces and kings, or 2s and queens. If you’re playing for money, any player who passes must put an additional unit into the pot. Fan Tan’s original name, Play or Pay, was very much to the point. You can play a 7 in another suit if you have one. If you want to play another 7, you place it directly above or below the other 7. You don’t have to play another 7 if you have a different legal move that you would prefer to make. You can build up or down on any 7. If you have an 8 or a 6 in the appropriate suit, you put it down to the right or left of the 7. If you can’t make any other move, you pass. Similarly, the next player can either build up or down from the existing structures or pass. In Fan Tan, aces can only be low, and you can only play an ace after a 2, not after a king. If you can play, you must do so, however tactically unwelcome it may be to release a card that you’d rather keep in your hand. Often, you find that you don’t want to play a card that simply makes other people’s lives easier — but that’s Fan Tan life. A player who’s caught holding back in a stakes game can’t win the hand on which the offense occurs. After a few turns around the table, the cards form into piles on both sides of the 7s that may look like the ones shown. 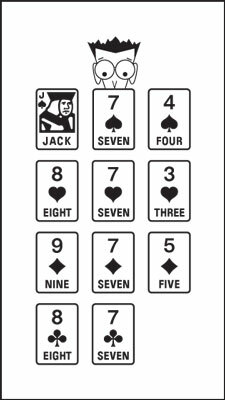 In the spade suit, for example, the 8 of spades, 9 of spades, and 10 of spades are nestled beneath the jack of spades, and the 6 of spades and 5 of spades are invisible below the 4 of spades. Running high and low in all the suits. Here, the next legal cards to play would be the Q of spades or 3 of spades, the 9 of hearts or 2 of hearts, the 10 of diamonds or 4 of diamonds, and the 9 of clubs or 6 of clubs. The player with the action can play any one of these cards or pass if he can’t. When a pile comes to the end of its natural life (when an ace or king stops the sequence from advancing any further), turn over the pile to indicate that fact. The first person to get rid of all his cards wins, and play immediately stops. He takes the pot (which consists of the antes plus any additional contributions made during the hand) if you’re playing the game with stakes, but before he does that, all the other players put in one unit for every card left in their hands.